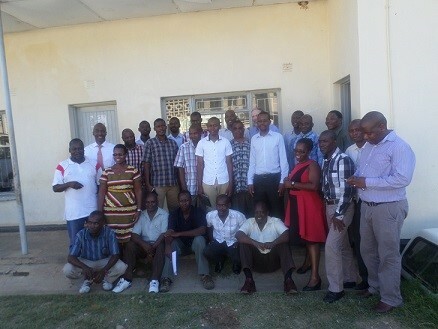 Southern Africa Resilience Innovation Lab (SA RILab) in collaboration with the Nsanje District Council, through the Office of the District Commissioner recently held a Stakeholder Panel Workshop at Nsanje Discovery Lodge in Malawi on the 9th of February 2016. The workshop was convened as a preliminary activity for the upcoming deliberative poll in TA Nyachikadza in Nsanje District, to be held by Southern Africa Resilience Innovation Lab (SA RILab) of the ResilientAfrica Network (RAN).The District Council, through the office of the Disaster Risk Management Officer, worked closely with Lilongwe University of Agriculture and Natural Resources (LUANAR), a RAN-partner university in preparing for the workshop. The workshop was opened by Dr Donald Makoka the SA RILab focal person followed by a presentation by Ms Christine Muhumuza who gave an overview of RAN and RAN’s Resilience Strategy. Mr Humphrey Magalasi the Nsanje Disaster Risk Reduction Officer of the Department of Disaster Management Affairs set the stage for the discussions by presenting on the past experiences of flooding in Nsanje. He highlighted common hazards as a result of the floods including disease outbreaks, damage to crops, infrastructure, livestock and disruption of educational activities. Several initiatives and recovery practices have been initiated including Public Works Program (PWP), Input for Asset (IFA), Social cash transfer and the Malawi Flood Recovery Project (MFERP), relocation and using early warning systems. Prof James Fishkin of Stanford University, a key partner of RAN also presented on Deliberative Polling as a tool of creating and engaging key stakeholders in the policy formulation process. He highlighted the importance of this tool as way of listening to peoples’ voices during decision making. The fifth presentation was made by Prof Lekan Ayo-Yusuf, the Southern Africa Lab Director of the RAN. He focused his presentation on the on-going work that the SA Lab has done in South Africa, Malawi and Zimbabwe. Specifically, he introduced a model on how resilience can be built among affected people and explained on adaptive and absorptive capacity. He emphasized the central role that human capital plays in building resilience. The final deliberations at the workshop discussed three policy options in preparation for the Deliberative Polling to be conducted in May 2017. These focused on policies affecting relocation and resettlement, proposals to reduce vulnerability in the existing communities and various policy options on population pressure, gender and social services.